Rev. Ronald R. Chambers was born to Robert and Mary Chambers in Indianapolis, Indiana. He was educated in the Indianapolis Public School System and has a business degree from Indiana Wesleyan University. He married Margaret A. Brooks in 1987 and they have two children, Ahsya and Anthony, and one granddaughter Aaraelyn Chambers. Pastor Chambers accepted his ministry calling in 1988 under the leadership of the late Presiding Elder Rev. Leonard N. Williams, Sr. at Allen Chapel AME, Indianapolis, Indiana. He received his first pastoral appointment in 1992 at Bethel AME, Plainfield, Indiana. He has served as pastor at Bethel AME in Lafayette, Indiana, St. Luke AME in East Chicago, IN, Bethel AME in Jeffersonville and Bethel AME in Davenport, Iowa and Bethel AME Clinton, IA. He was recognized by Alpha Phi Alpha Fraternity Mu Chi Lambda Chapter in 2010 for his Community Service and also by Davenport Community Schools S.T.A.R.S. Mentorship Program for being a mentor. October 2015, Rev. 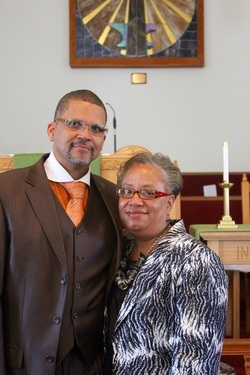 Chambers was assigned the pastoral charge of Bethel AME in Carbondale, IL and Shaffer Chapel AME in Colp, IL. Pastor Chambers not only pastors his members, but also believes it important to pastor the community where he lives and where his church resides.